We are Ireland's leading Make Up Artistry school offering courses with international qualifications, which gives students the opportunity to pursue a career as a make-up artist worldwide in Fashion, TV/Film, Media, Bridal and much more. We have a full range of make-up courses available to suit all levels. 75% of the training is practical work which allows the students to reach a level of proficiency and competence before qualifying. We have successfully placed over 90% of our graduates in employement worldwide. 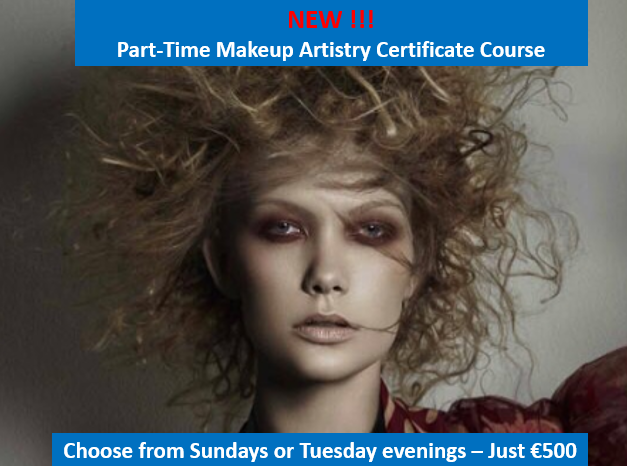 The Courses are ideal for those who would like to start a business of their own, and are also beneficial for those already working in the beauty industry, to enhance their skill and techniques and to further your education. The School of Make-up Artistry, offer a wide range of Internationally recognised Diploma courses, in fashion, film, theatre and media make-up. Check out our Gallery for some previous work of our students. I have just finished the Part Time course in makeup artistry at the college. I have learned so much, to look at pictures from the beginning of the course and the makeup I can do now is all the evidence I need that the course was a success. The teachers are all so helpful and their techniques really simplify some of the more difficult things to do like winged liner and brows. Not only do they teach you their techniques but they also give you advice on how to get a job after and different ways you can promote yourself. Katie is such a lovely teacher also, she is a continuous help even after the course is finished. She has helped me with interview techniques and how to prepare for same. Overall I would say if you are interested in makeup and want to improve your skills this is the course for you. I cant thank them all enough for all they have taught me and done for me. I just finished the part time diploma course in the school of makeup artistry it was an amazing experience. The school tutors were excelent and really helped me develop new skills and techniques. My skills have really improved thanks to all the talented tutors. Katie was brilliant all the way though the course and after completing she is still willing to help out in every way possible. I attended the International school of makeup artistry from 2013 til 2014, i took part in the part time diploma course. I loved my time there and enjoyed going to every class, i learned a lot from Katie and all of the other tutors. Even though i was already working in the industry i was happy with my current position but after completing and passing the diploma course i felt i had the skill and confidence to pursue my dream job with Smashbox Cosmetics and with great thanks to Katie and her team i was able to land that position and am now working for Smashbox as makeup artist and crew member in Boots Athlone.